I grew up with Intellivision and Atari. I witnessed the incredible evolution of the video game starting from the Nintendo 64 through the next 15 years leading up to the Playstation 3 and Wii consoles. Harkening back to memories of those early days, I am always pleasantly surprised how the iPhone and iPad have allowed a new crop of back-to-basic fun video games to sprout up from amongst the cinematic epics of the modern super-computing consoles. My first tip: visit ign.com. If you don’t know about IGN, then I feel elated that I just might have added some value in, what could be, your otherwise lacklustre day. These guys are the definitive source of video game reviews. They have been reviewing games for 20 years, and the understand the art, dynamics, game-play, feel and design patterns of the video game. The reviewers have a keen appreciation of the “art” of creating a game. The reviews are almost always bang-on. Their top rated gates are those that are unique and have longevity, and are truly worthy of your spare time. It’s only been recently that they started paying attention to the iPhone and mobile platforms – I might dare say they ought to have done so sooner. You can find their top iPhone games here. I am writing here about those games that don’t require an epic commitment, that you can play while waiting for the bus, killing 20 minutes waiting on the tarmac, standing in line at the bank or flaking on the couch before your friends come over. These games are about the “pick-up and play” variety. Obviously, everybody knows about Angry Birds, Cut the Rope and Fruit Ninja. These are the staples for the iPhone gamer newcomer. I wanted to list a few more that, while they may have been featured at one time or not at all, might just be faded amongst the noise of the thousands of apps out there. I always spend a lot of time searching for a new game, and wading through tonnes of reviews and the App Store is exhausting. Also, everyone is just reviewing the latest apps What was clear as I was writing this and getting my facts straight, was that the Summer of 2011 was a pretty awesome year for games. Groove Coaster – Ranked #2 of all iPhone games by IGN, this “tap-tap-music” game tests your ability to match the beat in a retro-style groove-course; tap-flick and swipe yourself to the goal with perfection to score and advance, features an original techno-soundtrack, what keeps me coming back is the cool music; while it has received many accolades, I personally like a lot of the ones listed below (released Summer 2011). Bike Baron – Rated “Great” by IGN, this game is about navigating your motorbike through an obstacle and looped-filled side-scrolling course, it has elements of puzzle solving as you learn how to navigate the tricky courses, as well as an action-slant as you try to beat your best time, win by finishing a course, collecting all the coins on a course or beating some set times, the draw here is heart-pounding fun, what keeps me coming back is the challenge of clearing all the courses (released Summer 2011). Of all the games listed here, I think I have put the most into this one – and user-defined tracks means there are always fresh updates with new challenges across all skill tiers. Geometry Dash – This is my new favourite. The little square that could… a side-scrolling action game where your little square jumps, leaps and slides through a tricky obstacle course, this game is a cool mix of Groove Coaster and Bike Baron (similarities to Groove Coaster in that the cool sound-track gives cues to your jumping to help navigate the course, and similarities to Bike Baron in that motor-memory and solving the course are key), the techno-soundtrack is awesome, the goal is to finish the levels that run about 75 seconds (sometimes taking almost 200 attempts for me), the draw here is the challenge of finishing the courses and inching ever-closer on each attempt (released Summer 2013). This is my current favourite. World of Goo – Another top-ranked game by IGN the World of Goo is another physics-based game where the goal is to contract structures from varying types of goo balls to bridge to the level-exit, an original classic on the Wii ported to iOS beautifully, the draw here is the puzzle-challenge of constructing and assembling the goo balls as optimally as possible and saving more goo-balls that everyone else on the planet; civil engineers would love this game (release Spring 2011 – obviously 2011 was a good year for games). Jetpack Joyride – Cool side-scroller where the goal is to go-the-distance through laser obstacles and missiles, adding a variety of different vehicles, the draw here is out-doing your personal best distance and collecting coins to get more utilities to help you progress, what keeps me coming back is the challenge of beating my personal best (released Summer 2011). I have logged a lot of hours on this game. Lumines – Addictive block-dropping puzzle action, this is a much cooler version of Tetris, I hold a special heart for Lumines owing to my addition to Lumines II on the PSP, the iPhone port is an abridged version with less cool music, but I still love it none-the-less. 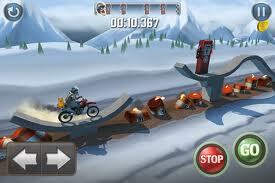 Bike Baron: Best crash scenes ever, too. The bottom line: Bike Baron is a hands-on favourite for arcade-loving fans that want an easy pick-up-and-play game, and World-of-Goo is a treat for any puzzle-minded individual. ← RedBubble: Cheer, and Inflated Problems Avoided.